Who doesn't know Haagen Dazs? I believe most, if not everyone, would have heard of this amazing brand. One that made kids beg their parents for during their birthday, getting the priciest ice cream cake available. In anycase, I'll cut it short - They have launched a series of new flavours for all of you to enjoy! 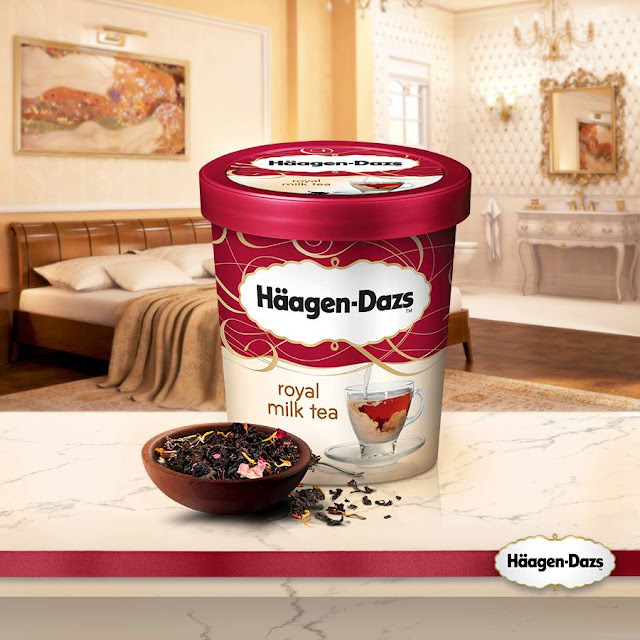 The Royal Milk Tea, one of the latest flavour introduced my Haagen-Dazs and is set to pair with two other signature flavours; matcha and coffee. Their version of the Royal Milk Tea boasts the perfect blend of premium fresh and sweet Darjeeling tea and strong, malty and honey-like Assam tea to deliver to most delicate yet intense floral flavours. Starting off rather strong with a selection of Banofee Royale, topped with their latest Royal Milk Tea ice cream, whipped cream, nuts, banana, caramel and more ice cream, this cup of parfait is certainly worth going for. For those who enjoys Chai Tea, this might be your pick. Though I find it to be slightly on the sweeter side, there were some who enjoyed it. Smooth, creamy and packed with a good amount of chai flavoir, Haagen-Dazs's new Chai Tea Frappe is pretty good. Similar to our standard coke or root beer float, but with coffee instead. Drinking it before the ice cream melts gives a rather acidic note, as the ice cream slowly dissolves, it gets sweeter and sweeter. They have also recently introduced their matcha float, which was packed with a good amount of matcha flavour, and a tad bit of sweetness. The drink is rich to say the least and most matcha lovers are gonna enjoy this. A Haagen-Dazs special, an ice cream croissant sandwich. To begin, the croissant was one of the best parts of the dish - with it being extremely flaky and buttery. The accompanying royal milk tea and coffee ice cream too worked really well hand in hand. As an overall, it tasted really nice as all the element worked in harmony. Overall, if you're a fan of ice cream, or any of the above mentioned ingredients, you have to check them out. Also, Enjoy 10% discount until the end of April 2016! So what are you waiting for? Head on down to any Haagen-Dazs Malaysia today!